Young Harry Davies-Carr rubs his injured finger, staring at his baby brother, the faint reproach in his voice tempered with love, pride, and mild outrage that the precious little tyke would chomp down hard enough to actually cause him pain. Chubby-cheeked Charlie emits a particularly evil chuckle, and the tension is broken. Daddy Howard, who happens to have been watching the whole scene, records it for posterity and uploads it on Youtube to show the boys' godfather. Little did he know the snowball he set rolling would result in an avalanche. The video was uploaded in May 2007, and quickly went viral. As of today, with some 179 million hits and growing, it remains one of the most frequently viewed videos ever. Charlie and Harry aren't the only kids unwittingly propelled into superstardom by a Youtube video. There's the David after Dentist video where a young boy is still high off the anaesthetics his dentist dosed him with before a tooth extraction, and ends up spouting such existential questions such as 'Is this real life? Am I going to be like this forever?" He says it all pretty deadpan too, which adds to the humour. Baby/kid videos have been popular since television came into being, what with shows like Kids say the Darndest things and Candid Camera and so on. With the advent of sites like Youtube, capturing your wean's precocious words and antics and sharing them with the world has never been easier. All the humour, all the irony, all those "Aww" moments are now just a click away. There's that adorable video called Blood, which features brothers Daniel and Ryan, where the older brother accidentally bashes the younger one, causing a nosebleed, and then goes into a panic and tries to elicit Daddy's help by explaining that the baby's got 'bludd-ah', and that the matter is 'no funneeeeh!" In another video, called I don't like you, Mommy, this other kid matter-of-factly tells his Mom that he only loves her when she gives him cookies. Closer to home is this adorable video in Hindi, of a little girl sitting on her father's lap, and acting out the different parts of a story he's telling. And there is pleasure to be felt in watching these videos, knowing that a transient moment of innocence has been frozen in time. If only people left it at that. When the going's good... someone's going to find a way to cash in, and the baby videos are no exception. 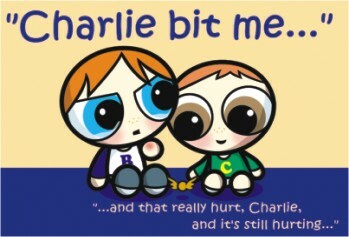 Public interest in the Charlie bit my Finger Again video soon prompted television interviews, the first one aired on Channel Cactus being available on Youtube on Howard Davies-Carr's channel. After a rather disturbing re-enactment of the whole finger-biting episode, the presenters Richard and Judy asked the Davies-Carrs what their future plans were. Hearing that a third Davies-Carr boy was already on the way, Richard jokingly stated 'You have to recreate this video, this time with Charlie getting bitten. This could be a whole dynasty of finger-biting!" The off-hand comment was only a precursor of things to come. The boys now have their own blog and video series, and "Charlie Bit My Finger" T-shirts and limited edition calendars have been made. What started as an innocent moment shared by two brothers has now become an enterprise of sorts, with dad Howard chasing them around with a camera, occasionally staging scenes for them. The boys' mother, Shelley Davies-Carr stated in another interview that her sons were shy about their new fame, and embarrassed to see themselves on television, and furthermore, they were often hounded for autographs. Considering that the eldest boy, Harry, is only 7 years old, and the infamous Charlie about 4, that's a lot of pressure to be putting on kids this young, and furthermore when they hadn't really done anything to earn any special notice. A similar story holds true for David, he of the happy-gas from the dentist. 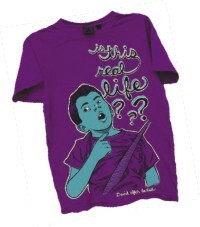 The boy has his own website and 'Is this real life?" T-shirt line. Talk about taking the spontaneity out of a magical moment. What parent doesn't take pride in his/her offspring? How many times have you, as a child, been dragged, squirming, in front of guests to sing a song, or recite a poem, or even share some witty anecdote so that they can go ooh and aah over your talents? It's only natural. However, in this day and age of instant gratification, children are being propelled into the limelight without having earned the right to do so. This is not to say that there aren't some seriously talented young people out there; heck, kids like Funtwo and Emily Bear deserve all the accolades they get for their mad musical prowess. But for every Sungha Jung, there are dozens of tykes like that Jason Mraz ukulele boy who are just being kids and goofing off. If the latter type suddenly find themselves the centre of attention without having really done anything to merit it, that's a recipe for trouble. We've all followed the rise and fall of child stars like Michael Jackson, Macaulay Caulkin, Britney Spears, and Lindsay Lohan (and the writer implores her readers not to beat her up for lumping them all together). These stars paid a heavy price for early fame, but at least they had their talent and hard work for fans to remember them by. It's because of this talent that other former child stars like Drew Barrymore and Robert Downey Jr were able to get their careers back on track. What happens to the youngster that accidentally stumbled into public notice without the fallback of any special aptitude? Or those who don’t have famous parents to bail them out? (Suri, we’re looking at you) Come to think of it, whatever happened to most of the Notun Kuri winners? In an article in The Guardian, Emma Brockes talks about how 25 years ago, children aspired to be teachers, bankers, doctors. Now they just want to be celebrities. Often, it doesn't even matter what the celebrity gained fame for, as long as s/he is famous. The article quotes Rachel, a character from the TV show Glee, who says "Nowadays, being anonymous is worse than being poor." Indeed, with platforms like Facebook and Twitter, exhibitionism is the name of the game anyway. But what made these baby videos and these tiny darlings such a treat to watch was their innocence and spontaneity. Richard from the Cactus Channel beautifully encapsulates the charm of the Charlie Bit Me routine as 'running the whole gamut of human emotions - fear, love, pain, surprise, what have you, all in the space of thirty seconds." The beauty in this is that its real. Put it on a mug, or turn it into a sideshow, and you've missed the point. Let the kids be kids, shall we?